Most types of bike racks can be used on SUVs and crossovers such as the Honda CR-V, Ford Explorer, and Toyota 4Runner. Because many SUVs are designed more for heavy-duty utility use than the average sedan, they are more likely to have a hitch or crossbars. If your SUV has these extra features, you can use any of the three main types of bike racks: hitch-, roof-, and trunk-mounted. And you won't have to install any extra equipment on your vehicle. Hitch-mounted bike racks are easy to install and remove from a hitch at the back of an SUV. Because these racks connect to a hitch and don't touch your SUV, you don't risk damaging your vehicle's finish. If your SUV has a spare tire mounted on the back, you need to make sure that any hitch-mounted rack is long enough to clear it. The length of the shank (the portion of the rack that slides into the hitch) varies among the different models of racks, so some place the bikes out farther from the back of the vehicle than others. If you want to open your SUV's hatch or doors while the rack is mounted, consider tilt-away and swing-away racks. Racks with these features tilt down or swing out on hinges to allow you access. If your SUV doesn't have a hitch, you can install one. Most hitches can be installed with basic hand tools and don't require drilling into your vehicle. See our fitguide to find a custom-fit hitch for your SUV. One great advantage of roof-mounted bike racks is that they allow you to easily access the back of your SUV. This access could be important if you tow a trailer, use a hitch-mounted cargo carrier, or need to load or unload gear frequently. Also, a roof rack doesn't make contact with your vehicle, so it won't scratch the paint. 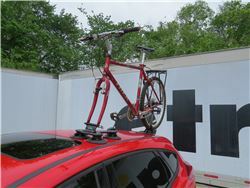 To mount bikes, you'll have to lift them higher than you would for a hitch- or trunk-mounted rack. This can make it difficult to load a bike. You may need a step stool to put your bike on the roof. You can carry more than one bike on your roof, but you will need a rack for each bike. The only limits to the maximum number of bikes that you can carry are the width of your crossbars and the weight limits of your SUV's crossbars and roof. If your SUV doesn't have crossbars, you can have them installed, or install them yourself. See our fitguide to find a custom-fit rack for your vehicle. Many SUVs have hitches and crossbars, but if yours doesn't, consider a trunk-mounted bike rack. This kind of rack attaches directly to your vehicle's hatch, so it doesn't require crossbars or a hitch. All you need to carry bikes is the rack itself. 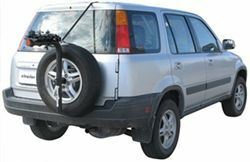 Trunk-mounted bike racks attach to your SUV's hatch or doors by means of hooks, straps, and buckles. Most of these racks have padding at the places where they contact your vehicle. But to avoid getting the finish of your SUV scuffed or scratched, it's a good idea to make sure the paint is clean and free of dirt before you mount the rack. If your SUV has a spoiler, you can still use a trunk-mounted rack. Many models are designed to work on vehicles with spoilers. Avoid trunk-mounted racks if your SUV has a spare tire mounted on the back or if you have an automatic rear windshield wiper. These racks won't fit over a spare tire and can interfere with a rear windshield wiper. If the spare tire on your SUV prevents you from using a hitch- or trunk-mounted bike rack, consider a spare tire-mounted rack. These racks connect to your vehicle's spare tire. 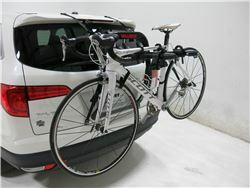 Like trunk-mounted racks, these racks do not require any extra equipment (a hitch or crossbars), which can make them an economical choice for transporting bikes. 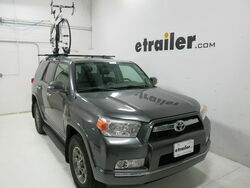 These racks are also a good choice if you want to tow a trailer while carrying your bikes. One downside is that you might have to remove bikes, and in some cases the rack, to open the hatch or back door of your vehicle. Some of these racks can carry up to 3 bikes. Vacuum-mounted bike racks attach by means of vacuum cups to the trunk, roof, or glass of your SUV or crossover. These racks can be attached to almost any vehicle, just position them anywhere they will fit. Also, the racks can easily be transferred among different vehicles. So if you have more than one vehicle but don't want to have to consider buying more than one rack, a vacuum-mounted rack could be a good choice. These racks are also easy to attach and remove, taking just seconds. When you attach the rack, be sure the mounting locations are clean to help eliminate any potential scratching of your minivan's finish. These racks could interfere with opening your minivans's rear hatch, depending on where they're located.